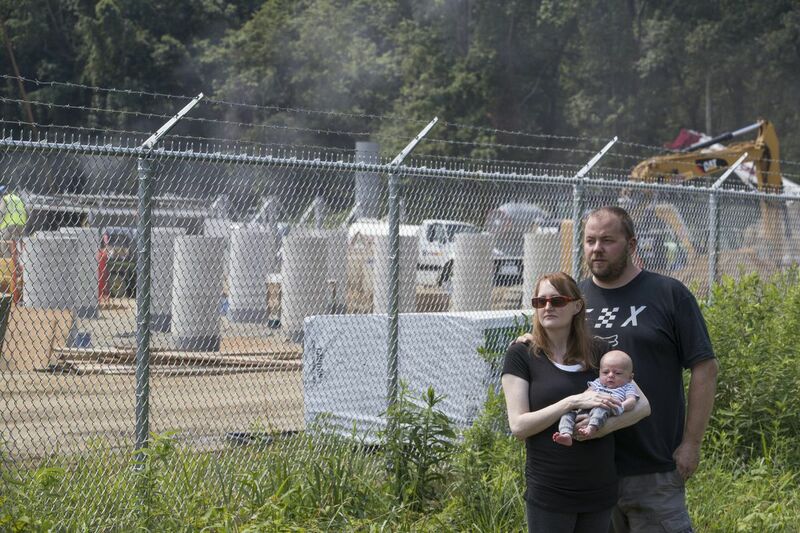 Katie and Mike Marlin stand with their 7-week-old son, Ryder, by the the construction site for the pipeline. In Chesterfield Township and Bordentown, a fight is brewing over a proposed natural gas pipeline that would connect the Burlington County township with Manchester Twp in Ocean County. Chesterfield Township residents Mike and Katie Marlin have a new baby and a new neighbor. Their 7-week-old son, Ryder, is a joy. After Sunoco pipeline drilling taints private Chester County wells, critics worry: What’s next? But the start of site-preparation work for a natural gas compressor station — visible from the window of Ryder's nursery — is not. "It's devastating that they could come into a small, quiet town to build a monstrosity," says Katie, 34, an executive assistant. The station on Route 528 just east of the New Jersey Turnpike in Burlington County is designed to monitor and maintain service mainly to New Jersey Natural Gas customers in Ocean County, via a proposed underground pipeline that would pass within 75 feet of the Marlins' Cape Cod-style home. Proponents say the $116 million, 40-acre station and $180 million, 30-mile pipeline — called the Garden State Expansion and the Southern Reliability Link, or SRL, respectively — will bolster the resiliency of New Jersey's natural gas distribution system in cases of disruptions, or natural disasters like Hurricane Sandy in 2012. Opponents say the projects are unnecessary because the system already is resilient. They also say building the New Jersey Natural Gas pipeline across northern Burlington County will increase the state's reliance on fossil fuels and threaten the environmentally sensitive Pinelands. Environmentalists and others continue to be incensed — can you blame them? — by the N.J. Pinelands Commission's dramatic about-face on a separate, 22-mile South Jersey Gas pipeline between Cumberland and Cape May Counties. After narrowly rejecting the company's application for the project in 2015, the commission's board was re-shaped by Gov. Christie's administration; last February, an amended South Jersey Gas application for the Cape May-Cumberland pipeline was approved. For the Marlin family, some pipeline-related worries are literally closer to home. "What are the long-term effects of the pollution that's going to be coming out of the station every day?" Mike, a 36-year-old mechanic, says. "There's a chance of an explosion that could completely destroy our house." Some might regard such fears as exaggerated. But however remote the chance of an explosion, would you want to live near a natural gas compressor station? "It's a large-scale industrial facility that runs 24/7, is noisy, and creates a lot of air and water pollution," says Jeff Tittel, senior director of the Sierra Club's New Jersey chapter. Local residents and organizations such as People Over Pipelines, as well as the Sierra Club, Food and Water Watch, and the Pinelands Preservation Alliance, are mobilizing against the latest plan. A dozen miles of the SRL will traverse areas protected by the state's Comprehensive Management Plan for the Pinelands. "We're strongly against the compressor and the pipeline," says Carleton Montgomery, executive director of the Preservation Alliance. "It's completely unnecessary and obscenely expensive … a stupid idea." He also wryly notes that the station is being built before construction of the pipeline has been authorized. "It means they [compressor station builders] are feeling confident," Montgomery says, adding, "They want to make it a fait accompli." Both projects have been approved by the Federal Energy Regulatory Commission (FERC) and the state Board of Public Utilities. The New Jersey Department of Environmental Protection has issued permits for the station and for a pipeline segment of less than a mile in length in Monmouth County. Chesterfield Township Councilwoman Rita Romeu and environmentalist Glenn Ashton walk through a wooded area near the compressor station construction site in Chesterfield Township, Burlington County. The station would maintain the flow through a proposed natural gas pipeline to Manchester Twp. in Ocean County. I couldn't reach a spokesperson for Williams, the Oklahoma firm whose Transco division is building the station. But Michael Kinney, director of communications for New Jersey Natural Gas, had plenty to say about criticism of his firm's project. "Opponents … will say anything to advance their own agenda, irrespective of whether it is true," he said in an email. "The SRL significantly strengthens our system by providing a second interstate feed from a different interstate pipeline, thereby enhancing resiliency." Workers install pipeline near the border of Chesterfield and Bordentown townships for a natural gas compressor station being built just east of the New Jersey Turnpike. In Chesterfield, where the Crosswicks section dates to 1677, Rita Romeu and others became involved when plans for the compressor project began taking shape publicly about two years ago. "We went door-to-door to every house within a quarter-mile of the compressor station, asking people about their wells," says Romeu, a semiretired health-care compliance officer who was elected to the township committee last November. I spoke with her and with Glenn Ashton, who serves on the environmental commission of adjacent Bordentown Township, at the compressor station construction site one hot afternoon last week. Heavy equipment roared and hard-hatted workers swarmed against a verdant backdrop of towering trees. "It's such a shame to see this going on in such a bucolic setting," says Ashton, 62, a semiretired insurance manager. He, Romeu, and other opponents don't buy the minimal impact projections of FERC's 2015 assessment of the compressor project. It concluded that the facility "would not … significantly [affect] the quality" of the environment. "Living so close," Katie Marlin says, "it doesn't matter to me what they say."